Cool... somebody Sarah at One Year 1.5 Pounds Per Week a Day at a Time gave me an award. 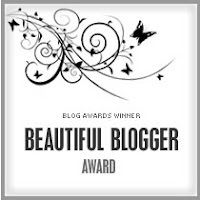 Accepting this award means I have to tell you 7 things about myself, and pass it on to 7 other bloggers. I was married to my husband for 9 years before we had our first (and only) child. I'm married to a Canadian who is also a travel agent. I love to cook! I never have enough time, but I really really love to cook. And I think I'm pretty good at it too. I, of course, try to make healthier things than I used to, but every once in awhile I love to make a killer dessert. I'm afraid of roller coasters! I really hate them. When I was younger my dear brother-in-law made me go on Montezumas revenge at Knott's Berry Farm. I haven't gone on many coasters since then. Once I got old enough to maybe like them I actually was scared I was too fat for them and wouldn't fit. Sad truth is I am sure I was too fat for them, and wouldn't have fit. I'm allergic to nickle. I can't wear cheap jewelry. I have to either have a gold or stainless steel watch. But you know what... something weird has happened since I've lost weight, I am not as allergic as I once was. I don't think I could wear earrings, but necklaces are not a problem at all anymore. I wonder why that is? I love wine! I really do. I like red and white wine. I had this great epiphany the other night how there should be a wine truck for adults like an ice cream truck for kids. It could play "Scenes from an Italian Restaurant" instead of the ding ding ice cream music. Its my million dollar idea... I guess now out of the Internet for stealing. Tricia at http://enduranceisntonlyphysical.blogspot.com/. I am so inspired by Tricia's 125 pound weight loss, and I love that she has a child that is of a similar age to mine. She's also a runner! Lindsay at http://healthystride.blogspot.com/. Lindsay is training for a 1/2 marathon and has lost over 100 pounds. Also she has been so kind to support my blogging and always leaves comments! Thanks Lindsay! Joy at http://transparentjoy.blogspot.com/. Joy has lost 36 lbs so far, and is so real and true in her posts. Allie at http://www.mywardrobetoday.com/ I love the outfits you come up with. You inspire me to look better! Roni at http://ronisweigh.com/ who has lost and kept off 70 lbs for 5 years!!! She's also a mom, and I'm inspired by her running, especially the half marathon!!! Sal at http://www.alreadypretty.com/ I love your unique outfits, and how you promote the idea of positive body image no matter what your body looks like. http://fashion4economicallychallenged.blogspot.com/ I love this site. She does a great job. Sharon at http://www.goodtrueandbeautiful.com/. Thanks for teaching me that abundant livings does necessarily mean spending lots of money and having lots of stuff! WOW Sarah! Thank you for your sweet words. They made me cry! And I'm so excited for you and the incredible journey you've been on. That's a tremendous accomplishment - I bet you feel like the best mom in the world. YOU GO GIRL! And thank you for sharing your blog's recognition with me. Oh my goodness, you look fantastic! And you are so sweet to give me an award. Thank you, ma'am :) You truly are beautiful, and I hope your realization of that doesn't lag behind the weight loss. Congrats and know that you are an inspiration. As your sis I was amused at all we had in common--loving to cook, the wine part and being deathly afraid of roller coasters--but I found out on my honeymoon that if I didn't conquer that fear with your dear brother-in-law, we wouldn't be married too long LOL. Now I love them! Hi Sarah, Thank you so much for the award and the wonderful comment. You've made my day!!! Keep up your great work!!! You can do this!! Hugs! !